As Humphrey explains HRRC is “Human resource rich country” – Countries that are grossly over-populated and begging for money. India isn’t exactly holding out a begging bowl now but everyone seems to like the HRRC concept. Population controls don’t seem to work so let’s rejoice being over-populated. Every part of Modi’s statement is true but he appears to be left with no option but to see a problem as an opportunity – Population. A majority of our metros and other major cities have become too crowded and threaten a lot of social issues. Take a look at the unemployment statistics on this page. The percentage goes up and down but the absolute number of unemployed people keeps going up. (Rediff on Bangladeshis): In terms of illegal immigrants in Mumbai, Bangladeshis alone account for between 3.5 lakhs according to a minister and 16.0 lakhs according to Kirit Somaya, a former MP. What would you say about a government that can’t even get its numbers right on such matters? This is in no way to suggest that any of this population is involved in crimes but the possibilities that some may be cannot be discounted. But it sure is a matter of serious concern. At a hotel in Chennai recently, I was surprised to find the room-boys speaking Hindi quite comfortably. They told me they had come from Assam but I have a feeling they are from Bangladesh. Many taxi drivers, domestics, maids in Delhi are reported to be from Bangladesh. Narendra Modi dared to promise during the LS campaign that illegals will be packed and sent back. Forget that, our cowardly govts don’t even dare to release the census figures of 2011 with the demographics. 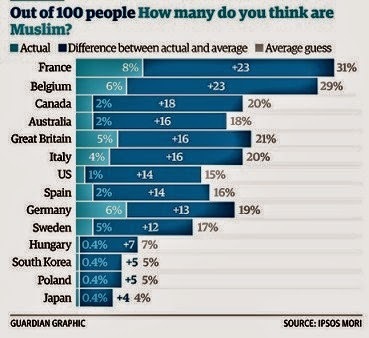 As much as there is a growth in Muslim population there is also a large Muslim population that is unaccounted. The Wall Street Journal in an article reflects how Muslim growth rate is outdoing Hindu growth rate. Actually, that’s not a correct statement. Hindus are registering a negative growth; a decline in population. In Europe the Christians are facing a negative population-growth while the Muslim population is increasing steadily. It’s not very different for Hindus in India who are facing a negative population-growth although they are still a huge number. Therefore, an anti-conversion bill is a must and is inevitable. The Chrislamist war on Hindus is fought on many fronts – Population is an important strategy and tactic. Imagine when they collectively reach 35-40% And that is not very unimaginable if the current situation continues. Excellent Ravi another masterpiece. I would like to share a video especially with the reference of last paragraph of your article. Email address please. I am unable to post the same in Twitter. Ravinar..your other initiative Educating Forward appears to be the only way for Ghar Wapsi for establishment of Sanatan Dharma. Swami Parthasarathy has written a book - "Fall of human intellect" - where he says that only thing that sets humans apart from plants and animals is the presence of Intellect. Intellect is faculty required to use logic and reason and discover the "Laws of Nature" through cause and effect analysis. Each of us is factory fitted with this faculty but there is no user manual or any training academy to help us to start making use of the same. All discourse in popular forums is based on data and correlation. Correlation is not causation. As long as we as humans keep on living in ignorance and total neglect of intellect, pseudo debates on religions will continue. Popular opinion flogging media personalities are in love with their own images and expecting them of introspection / reflection is foolishness. Excellent Ravinarji.....This is the reason why all these 10 years this secular ilk and their Queen Sonia Gandhi and her UPA didn't pressed to declare population figures. The onus is now on NDA. Let the country face the truth. Although this may appear off the subject, I would like to dare all these mediacrooks who are whining about freedom of expression of that tamil writer, do these mediacrooks have guts to republish Danish Cartoon in their News Paper on coming Sunday? Do they have balls to show us those cartoons on TV and discuss about those cartoons and the expressions in it, in their Prime Time debates? Arnav, Barkha, Vishnu,Siddharth, Salma/Sabrina Chota mota Blast fame Shrinivas, Bahut Krantikari Prasoon Vajpayee can your ilk do this? Do it first and then tell Hindus about freedom of expression. Cant but agree. There has to be a way of spreading this awareness fast. Govt needs to be pressured to conduct timebound fresh survey, results of which should be made known to public in a timeframe too. Why don't we have laws in India against the Blasphemy of Hindu religion and culture as Hinduism is the largest religion of India just like in England. Read this please. Excellent analytical and well researched part like the earlier ones. Sad that the topic is concluded. You seem to have the potential to write a detailed book on this subject with facts and figures and that will be a major release in all languages of India. What you said about the Bangladeshi muslims in our country is quite true, especially in chennai. Problem here is that our people are not able to distinguish them from an Assamese or NorthEast or Bihari due to lack of adequate Hindi knowledge. This is mainly due to the anti-hindi stance of our TN sikos who have spoiled TN in the last 50 years of Dravidian misrule and deception. They also are anti-Brahmin although being Hindus themselves, In the hate campaign of Brahmins they have caused incalculable harm to the whole hindu community. We should only call it 'irony of fate' that all this change in TN happened because of a maverick statesman Rajaji. For sure Rajaji also repented his mistake in heart, but his anti-nehruvian anti-congress convictions more than justified the irreparable loss of face, prestige and posiion to the community. That is one of the reasons many Brahmins of TN migrated to other states and foreign countries in search of recognition of intellect and restitution of economic independence. Successive congress governments in the centre and dravidian rule in TN contributed to this exodus of majority community of Hindus, not only Brahmins, from TN resulting in Brain Drain of the worst order. What is the purpose of identifying someone as Bangladeshi or as West Bengali? What next will you do? Writing some irrelevant thing. In LS election, it was shown that Bangladeshi in W Bengal have Aadhaar card and Ration card. Kirit Somaiah is also the current Lok Sabha MP.Please correct your post. Both Bangladeshis and Assamese may speak Hindi but they are not fluent we can make it out unless they assiduously learn the language and diction. into the trap laid by the media and so called secular brigades. You will not see any evangelical groups going to town shouting about their conversion or soul harvesting programmes. They rather do it covertly and infact have a higher success rate. Mr.Modi understands this game like no other. If he had imposed Yoga to domestic audience he would have surely been targeted. He rather choose to do it on an international forum, and also got their approval. He knows that if goras approve it our secular brigades will have no other option but to humbly accept it. By gifting Geetha to world leaders he is showcasing hindutwa in a subtle manner and sending a message that Geetha is the most valuable gift from India. On the other hand Sushma made a mistake by saying Geetha should be made a national book and was made to clarify on that statement by media.Now that's the difference between Modi and others. He has almost in a single handed manner decimated the Nehru dynasty. He is also slowly but steadily winning state after state and bringing in CM canditates from strong RSS background. Modi is here to play a long innings and lets all hope he does. fashion to achieve their objective. Not go around making statements like a loose canon. Just play the cards tactfully to beat them in their own game. I agree with your assessment .But are you assuming that both Sakshi and Yogi A are playing on the same side as Modi ? Could there be other interests ? Dear Rishi, I think we are also falling into the trap of media who are highlighting and also spicing up the statements (by linking them to wrong context) of Sakshi Maharaj and Yogi. Educated criminal minds with sold out souls can always get the better of rustics who speak their minds without buttressing their words. Sakshi and Yogi should learn to play mental games with media crooks, the way Modi learnt. And completely agree with you that Modi knows how to tame the wild dogs. Completely agree with your assessment of the likes of yogi and sakhshi maharaj. One can pardon them cos they are new to this game and surely well learn along the way. One thing I want to add is even if our corrupt MSM makes hue and cry about it, their words are surely reaching the common Man. They do are making the common Man to realise the danger ahead. Apart from our MSM and some Macaulay putras (who feel ashamed to be called Hindus), these people are reaching their target audience. Nothing can be done about it, anyway! I agree with you, most of the times. However, when I feel optimist, I think there is a way out. The first step towards that is to make it politically correct to talk about the demographic risk of selective population. Right now even a mention of it causes the MSM brigade to jump up and down. They won't even allow a debate on the same. Stopping this attitude can be a first step (which our beloved Ravinar is attempting in his columns). If I am not wrong Geetha gifted was Gandhi's Version of Geetha which many feels is distorted version of Original Geetha. And that fact blunted the attacking power of mediacrooks even more. This must have been the intent of Modi when he decided to gift Gandhi's version. You are spot on Nitin. Sometimes I wish that I could not read your blog. It takes away my bliss of ignorance. There is a sense of relief that somebody is articulating things which have been deliberately ignored for political gains and also a sense of dread stemming from fear of my county’s future. The so called secularists mock such facts calling it mindless fear-mongering by the RSS wallahs but the truth remains that where ever these Christian Missionaries and mullahs have landed, the native culture of that place has been completely destroyed. Though its a no-brainer that Uniform civil code and anti-conversion laws are the need of the hour, I’m highly skeptical about it being introduced in parliament. Modi is a brave man but there exists a bunch of cowards in his party apart from people who make brazenly stupid comments. BJP has consistently produced stupid people who ruin everything by making idiotic statements which has actually stalled some important, land mark decisions. Though Sakshi Maharaj has pointed out the demographical changes which is a serious concern, he singlehandedly demolished his own argument by that moronical “atleast 4 chidren per family” statement. I really hope that BJP gets its act together and we finally get to see the laws which India should have had when the constitution was first written. The Justice V.R. Krishna Iyer commission recommended among others two child norms. The usual seculars & minorities were immediately up in arms against this. No hindu group objected to this. 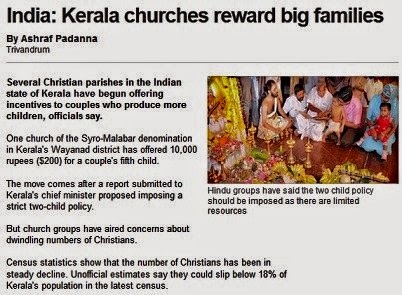 (Anybody can google and get all the details) It is only when some Hindu talks about having more children the usual outrage by the seculars and MSM. I really wonder why the MSM is so biased. Are they being paid? 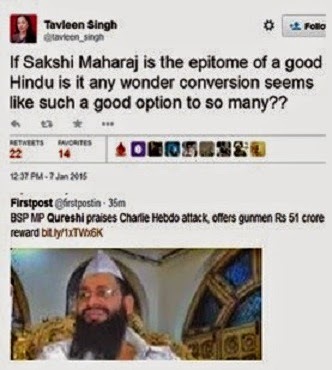 On whose pay roll are they to further the anti-hindu agenda of vested interests ? Quote "And nobody has their numbers and they probably don’t figure in any census reports either " . I too doubt the census figure but never read any authentic source or report questioning the official figures. 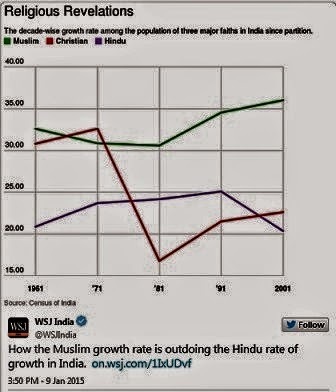 The assumptions goes like this : The number of Muslims in India reported by census is more or less near actual; but the number of Hindus have been inflated to camouflage the fast decline in Hindu population. (1) high percentage of actual polling in Chrislam majority states like Kerala and Nagaland etc where there is no need to inflate actual population figure . (2)low percentage of actual voting in states like UP and Bihar where Hindus are in majority only on paper . The numbers of Hindus are inflated like anything so as not to alarm or forewarn Hindus about impending doom. (3) poor utilization of fund / budget by states like UP and Bihar because of "less absorption capability"of population . This less capability is due to population on paper only. Massive loot of fund because beneficiary exists on paper only .contrast with Kerala where beneficiary actually exist so loot is public food distribution scheme etc are under check and could not turn in massive scale. (4) The transformation of Mr L K Advani from pro-India to pro-secular is because he realized hopeless situation towards which Hindus in India is moving . (6) Statement of Muslim leaders in 1980s especially Syed "Shah Bano "Shabuddin , having inside knowledge of government that Muslims constitutes 20% of all people living in India. Anyway these are hypothesis and looking for credible evidences to either substantiate it or rubbish it. The moment resurgent Hinduism gain some traction and our sidelined religious leaders like Aditya Nath,Jyoti n Sakshi Maharaj start talking some business- the opposition along with the KhanXrist lobby and saffron-phobe media start spreading media frenzies - as if hell will broke if we the Hindus are allowed to have the same way which they've been using against us since ages. They go back to their same old tactics of taking jibe, ridiculing, criticizing, studio-ing and some of them who are more audacious and rabid go ahead to demand retribution or apology from those sitting higher up. They want the 1bn strong Hindu community to remain apologetic even during the hay days of political power. Congratulations for the hard hitting article with facts & figures. Just imagine what kind of war will the Hindus, Sikhs, Jains & Buddhists have to face if 2 children policy & anti-conversion law is passed in parliament !!! All hell shall loose break because the wolves shall no longer be able to run amok. I sincerely hope NAMO Govt gets a 2/3rd majority in 2019 in Loksabha as well as Rajyasabha to pass these timeless bills in parliament along with Uniform Civil Code, Ban on Cow Slaughter & Article 370. That will be the last nail on the coffin of this anti-hindu politics. Shakshi Maharaj was very harsh in asking for 4 kids and reality happening in society is that young couples are having problem in having even 1 kids, forget about having 4 kids so fertility centers have mushroomed across all cities. He should have chosen words very carefully by asking to have at-least 1st baby fast not to wait for 3 or 4 years after marriage just in the name of settling down till they purchase own house, car, enjoying marriage life etc etc Gap between marriage and first kids had gone so high among new Hindu couples, which is also one main reason for decline in Hindu population. dear sir, though slightly out of context but i would like to share something. our company had entered into a joint venture with a german company. their director-international sales was in our city as our guest. we were discussing the markets (globally) and he told me that markets in europe and germany in particular were completely stagnant with no growth at all. i asked him the reason to which he said "we are just not producing babies"
Propaganda does have its effect.Many from urban middle classes and journalists from the right are already talking of "derailment" of development agenda by likes of Sakshi Maharaj.May be this is time for Hindus to operate more like Christians.Stealth is better than open [ and merely verbal ] In the meantime let us hope that this new government comes out with census data at the earliest.Can't we ask them through RTI? It is already 2015 and we don't know how many of us were there in 2011. Happy to hear that the chairperson Leela Samson has resigned. It is interesting to note that all Khangress sponsored deputees, always choose their exits to make some controversial (often self defeating) statements.... instead of making a silent and gracious exit. The other BJP team should learn from Narendra Modi in taming this media through a systematic behind the screen plays and moves..... instead of making wide out announcements. If they knew what was grace, they wouldn't be with 'khangress'! Gone are the days when parents did not have to worry about their children's future. Now a days parents see lakhs of rupees required to put their first child in a good KG, they decide against more children. Most uneducated parents who don't worry about such thing have more children. Most Muslims fall in that category, besides their religious belief. Should we encourage uneducated Hindus to do the same? It is 64000 dollar question. As the decade passes through out the world, population of educated people will decline and most countries' leaders will be like Idi Amin and what happened to Uganda in the time of Amin will get repeated through out the world. I may be crazy, but see a very chaotic world in 60-70 years. 8. hullabulla over priya pillai of green peac without mentioning she was flying to UK to present a paper- why not email or video con - green peace!!! Why the media is anti-Hindu? Arnab, bdutt, sardesai etc are the puppets. Who is pulling the strings actually and why? Brahmin Hindu Newspaper run by N Ram is the biggest anti-hindu. It's great post. thanks for shearing it. 1) Swami Shraddhanand was killed by a Muslim fanatic in 1926.He had written a biography of Muhammad which annoyed Muslims and one fanatic killed him. That happened in British India. 2) K.M. Munshi’s Bharatiya Vidya Bhawan’s Publications had brought out an Indian version of the American publication of Religious Leaders with a piece on Mohammad.There was a big agitation against it during the time of Jawahar Lal Nehru and it was banned. That happened in free India. 3) Salman Rushdie’s Satanic Verses met the same fate during the time of Indira Gandhi.That happened in free India. 4) Sanal Edmaruku, a self styled rationalist along with Professor Yashpal has insulted Hindu astrology, an integral part of Hindu religious beliefs with its shodas samskaras, and Hindu saints many times in television channels. Both of these critics never studied astrology and had their own irrational approach with their closed minds but the Hindus tolerated it all. But the self styled rationalist ran into trouble after he tried this trick against Christians in India---in the land of tolerant Hindus. It is mentioned in Wikipedia. “In April 2012, Edamaruku stated that the Catholic Church in Mumbai had filed a complaint under section 295A of the Indian Penal Code in several police stations around the city. Enacted in 1927, section 295A says: Whoever, with deliberate and malicious intention of outraging the religious feelings of any class of [citizens of India], [by words, either spoken or written, or by signs or by visible representations or otherwise], insults or attempts to insult the religion or the religious beliefs of that class, shall be punished with imprisonment of either description for a term which may extend to [three years], or with fine, or with both. Edamaruku had previously exposed the "miracle" of the dripping Jesus statue in Mumbai, confronted church leaders on a live TV channel a month earlier and had suggested that he might be arrested any moment. On July 31, 2012, it was reported that Edamaruku had moved to Finland and had been staying there for the past 6 months. “ This self styled rationalist , born in a Christian family of Kerala , has been driven out of India by Christians of Mumbai not by Hindus. 5) A website Islamwatch has been blocked by the present government of India in Jan 2015. The Hindu maulvis of Indian secularism can escape punishment in India by insulting Hindus for their beliefs in this land of Hindus started in era of Jawahal Lal Nehru by Nehru himself, a Kashmir Brahmin. Glad that you mentioned the case of Sanal Edamaruku.Those pseudo-intellectuals even questioned the great A.R.Rahman for just naming the word "hosanna" in a song in an unknown Bollywood movie 'Ek Haseena Thee'! !The hypocrisy and ignorance of rationalists, secularists and so called "intellectuals"( I sincerely doubt if that term has any genuine meaning today!) is so visible today, like no other time, that they are increasingly becoming explosive, but finally TRUTH stands out, whether they like it or not!! Super as usual Ravi. Read all posts together. It was great reading. When I was in college, the Kashmiri Hindus came to Maharashtra in great numbers and were admitted to Engineering/Medical and other colleges. My room partner, a Kashmiri Hindu, told me that one of the reasons they could be thrown out, was that they were an elite group of people. The Kashmiri Hindus were mostly educated, rich or middle class people with jobs in the organised sector. They had very little representation in the working class population. This meant, they had a lot to lose and chose to escape, as they probably had that choice. I can see the population in cities becoming a lot like that. A lot of Hindus, as they progress economically, have fewer and fewer children. Children of cleaning staff, drivers etc are receiving education and will soon join the organised labour. Contrasting this with the huge population growth in uneducated Muslim families, I can see many Kashmirs being repeated elsewhere. A very scary prospect indeed. Thanks for the whole series ...it was highly educational! Hindus, Jains and Buddhists should not complain too much. They asked for it with ahimsa, non-violence, Gandhi, vegetarianism. Hindus are basically traders, they cannot defend their own interests even with a chchapan inch ka sina, PM at the helm. It is all about making money, make money through scams, make money through dirty deals, make money through IPL, make money through cross border trade legal and illegal, ask for MFN status from Pak even as Pak kills our soldiers and civilians. Make money don't worry, be happy. It is precisely statements like these that this forum is trying to remove from the minds of Indians!! @Vivek, your comment is out of context. The scams you mentioned occurred, during UPA-2. Now Modi has let our Army show Pak Army its place by encouraging our army to retaliate whenever there was any violation. It is NOT out of context. Vegetarianism drives a stake into the heart of civil society and leads to societal decay. We have seen this in Maha, where communities that practice vegetarianism insist on excluding non-veg people from their housing societies. These communities also refuse to send their kids to serve in armed forces. Have you ever heard our chchappan inch ka sina PM call on such communities to send their kids to serve in armed forces? So what is the big deal. Are Christians and Muslims therefore not more nationalistic than these communities? So whom are we trying to fool? Where are the Mr India's now? Where do these Mr India's disappear whenever the going gets tough? Come on dudes Christians and Muslims are more patriotic than many Hindu communities who do not send their kids to serve in the armed forces. Accept it. Why chchappan inch ka seena is silent and not calling on these communities to send their kids to serve in armed forces? I don't know where you get the idea that Hindu's are not in the armed forces. If anything, minorities are even more of a minority in armed forces. Heck, i know of a lot of families with their only child serving in the forces. I myself wrote exams for the same. So what you want to convey is not the truth. Thanks a lot Ravinar. Very informative. I hope such issues will be discussed / debated in the MSM also when the present pseudo secular ones are made to go bankrupt and new hindu friendly papers and TV channels come up. 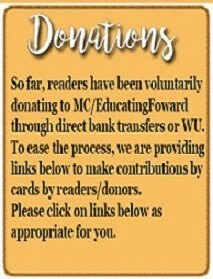 As a small personal contribution to this cause, I stopped buying the "anti hindu" paper called the hindu last year. I recently came across a news that that paper is on an austerity drive due to financial difficulties - it made me think that "acche din" seem to be slowly dawning ! Since Censor board is now cleaned of 'residual evil' why don't some movies are made highlighting the pains suffered by Kashmiri Pandits. Just like the Jews in USA make holocoust movies every now and then (Shindlers List, Valkyrie, Inglorious Basterds, Life is Beutiful ... etc). I would also like film makers to bring forth the genocide of Hindus during 1971 in East Pakistan. Censor Board members are not movie producers and movie directors. Those who are willing to invest a lots of money for such film, should have some confidence that their investment will not be throttled. As time goes on, it may happen and we may see movies like you suggested. It will take some time though. Excellent as usual ravinar. Personally for me, of all the dangers You mentioned in your posts against Hindus, this one is the most dangerous of all. This is the reason for the rise in 'secular ' politics, politics of appeasement because every one has a voting right in a democratic country like ours. The more their population increases, the more standard of our politics will come down (it has already) seeing this its only a miracle that modi got a huge majority by himself. May be for one Hindus United. But for how long?? That thought disturbs me too much. Ps : even the western countries are realising this problem now. But are helpless as this is the very a nature of democracy(votes stupid!!) . But ours is a mammoth task compared to them what with large swathes of illiteracy, poverty, ignorance. Our s is a fertile ground for population invasion as you have mentioned. This is a golden oppurtunity for bjp to get all the 70 seats in delhi. 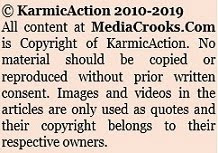 Kejriwal and AAP have been exposed as congress creation. People of delhi have now realised that AAP was created by congress and there is immense amount of anger against congress stooges like kejriwal, yogendra yadav, Aashish khaitan, sisodia etc. Notice carefully and you will notice that all congress slave media persons like rajdeep, barkha dutt, prannoy roy, shekhar gupta, om thanvi, abhay dubey , ravish kumar etc are now trying to create good image of AAP since they know that AAP has been created by congress. Congress created AAP to cutback on bjp,s votes. It's a pity our 'great' founding fathers never saw this coming. After all they were supposed to be visionary leaders. A Uniform Civil Code was/is as important as the Constitution, but no major leader ever pushed for it since 1947. Had we had one (UCC) much of the religious strife could have been prevented and 'secularism' wouldn't have become a euphemism for 'minority appeasement' which in turn is a euphemism for Muslims' appeasement. Surprisingly, our 'great' leaders didn't make secularism (in its true sense) a cornerstone of our Constitution. In fact, it was inserted in our Preamble to our Constitution as late a 1977 (42nd Amendment). Had secularism been practiced in letter and spirit by our political class, we would have been a more harmonious heterogenous country. For example: dalit and Muslim population growth rate is similar. The Christian population is showing wrong in the census and showing almost same around 2% from 1947 to 2011. Truth is so many Hindus have been illegally converted, but their name kept same Hindu name to get the benefit of Dalit and OBC reservations. If you include all these illegally converted people, their population will be close to almost 5%. Going by this, Hindus will become minority by 2050 or sooner. Some of the drop in Hindu and Sikh populations should be attributed to illegal abortions of unborn girl child. Hope Modi's call of 'Beti Bachao Beti Padhao' campaign will reverse this situation. It is not like Muslims and Christians are only having girls born to them. It was a pan-India problem, and not religion specific as you may want to portray. The law against test i believe came in the last time BJP was in power at the Centre.